Today was my scheduled C-section date. The babies would have been 38+2 and we would have checked in to the hospital to welcome full term twins and then arrived home a mere 4 days later to start our life together. 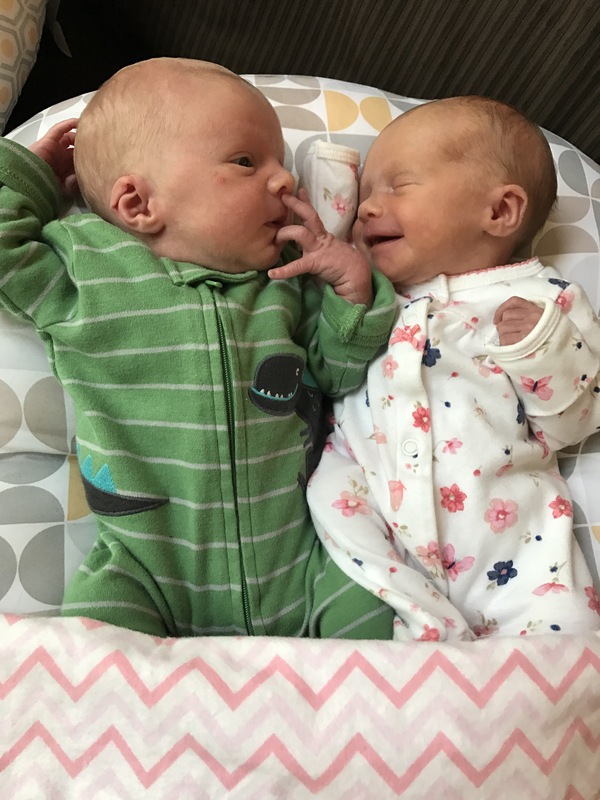 As you know, we welcomed Logan and Kirsten at 35+0 on May 10th after my water for Logan broke at 34+4 on May 7th, nearly a month earlier than we had planned. We had just finished running errands on this gorgeous summer-like day. 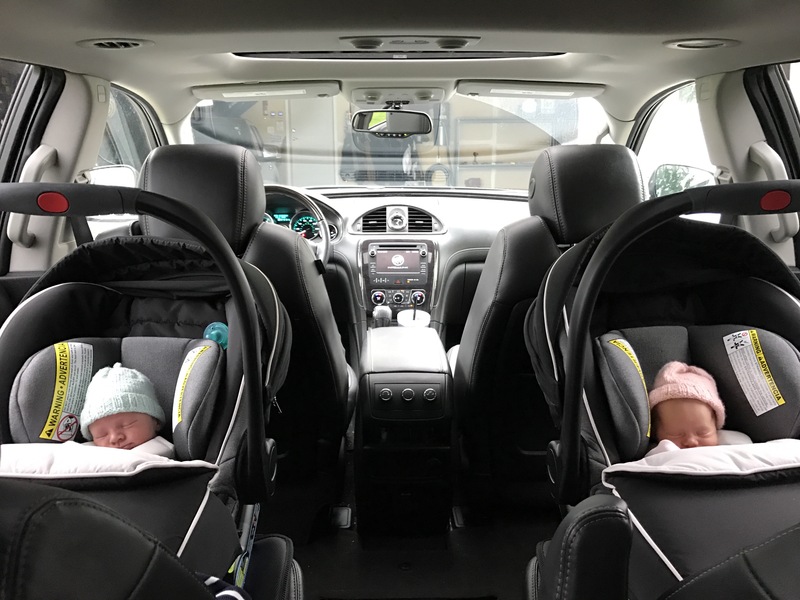 A stop to Menards to order a humidifier for their nursery, a swing through Carter’s to grab a few newborn pajamas for the hospital for the following month, a dash through Costco to grab a couple groceries for the week, and a stop at Jimmy John’s to grab a sandwich for lunch. As we arrived back home, Josh started to work on a garage reorganization project, tearing apart the inside to install some new shelving and make sense of some of the storage we kept in there. Since it was so beautiful out, Cali and I kept going outside to sit in a lawn chair with a book so we could visit with Josh in between laundry loads. I had just cut off all the tags for the new pajamas I had bought the kids and done a laundry transfer when I went back outside to sit for a while. I sat back into the lawn chair, facing Josh and the garage, admiring the fact that he had everything set out on the floors as he was going to beginning reorganizing, when WHOOOOSH. As soon as it happened, I knew it was my water. “Josh, my water just broke.” I remember calmly saying as I felt the warm fluid pouring out of me. My belly was so big I couldn’t get out of the chair without help, so I just sat there feeling it pour out of me. “Are you serious?” Josh stopped and turned wide eyed, probably equally anxious about the fact that my water broke and his garage was torn up, haha. “This is it. Yes, it definitely my water, isn’t it pouring everywhere?” As he walked over he said “No, I don’t see anything.” “Are you sure?” I replied, “it’s still flowing.” He walked over quickly to pull me up and once up, we realized it was a water proof chair and truly was holding all the fluid in a pool on the chair, haha! The next few minutes are a blur! We kept saying “THIS IS IT! Oh my gosh!”. I stood on the grass for another few minutes while my water continued to empty while Josh threw everything on the garage floor to the side so he could park the car back inside and then he helped me into the house, where I called labor and delivery and he frantically threw his bag together. The nurse asked how far away we lived and I said “30 minutes” and she replied, “then I’ll see you in 30 minutes.” I asked if we had any time for me to throw a few things into my bag (day of things, like a charger, make-up, etc.) and she replied “3 minutes max. Are you feeling the babies move?” I wasn’t but that was pretty typical of the 4:00 afternoon hour for me. I made a towel diaper of sorts and quickly redressed, tossed a few things to Josh to load into the car and said a quick goodbye to Cali. Knowing that was the last time I was seeing her before she became a big sister was so bittersweet and I wish it could have been longer, but I knew I had to get to the hospital as soon as possible. Within minutes of my water breaking, we were off. We weren’t nervous, just in excited shock! We calmly called our parents and siblings and 2 of my best friends, all while navigating Sunday roads that seemed to hold far too many cars for the 4:00 hour. Everyone was so excited and the calls were quick, asking for prayers that I could hold off on delivering till at least past 9:00 pm, as my blood thinning shots (for my factor v) were still actively in effect and would cause complications if I were to deliver before that, including having to be fully put under for a c-section, and I so wanted to be awake and alert! Once we got to the hospital, we double parked and Josh wheeled me in, 39 minutes from when my water broke. It was such a surreal hour, I can’t even explain it. We quickly were brought to our room (5) within 5 minutes and they quickly began to work on locating both heartbeats. These babies had been a little more difficult to both find and that remained consistent once we arrived. 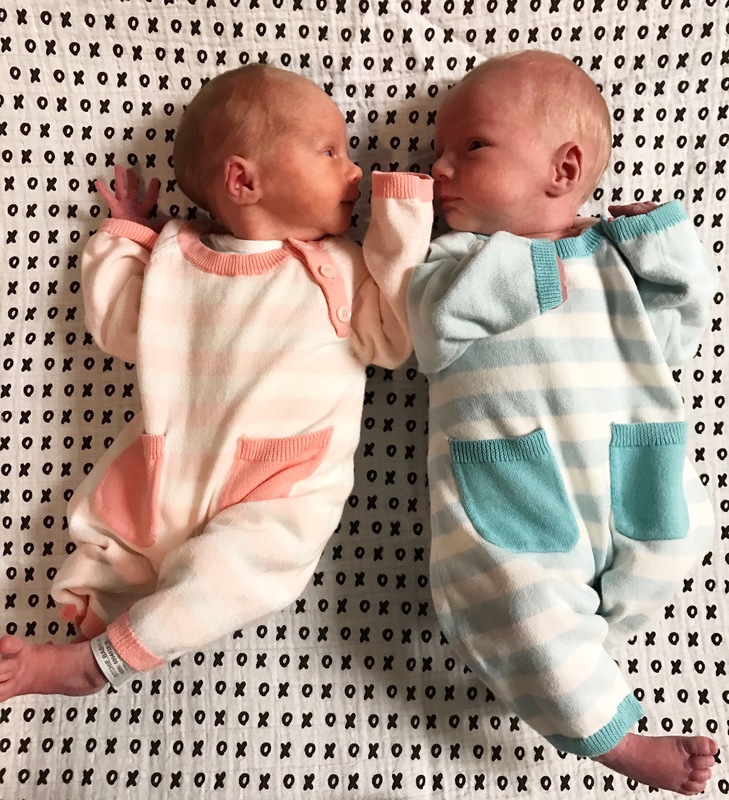 They commonly had similar heartbeats, mirroring each other for over a minute often, which usually led nurses to believe they had the same baby on the monitors. 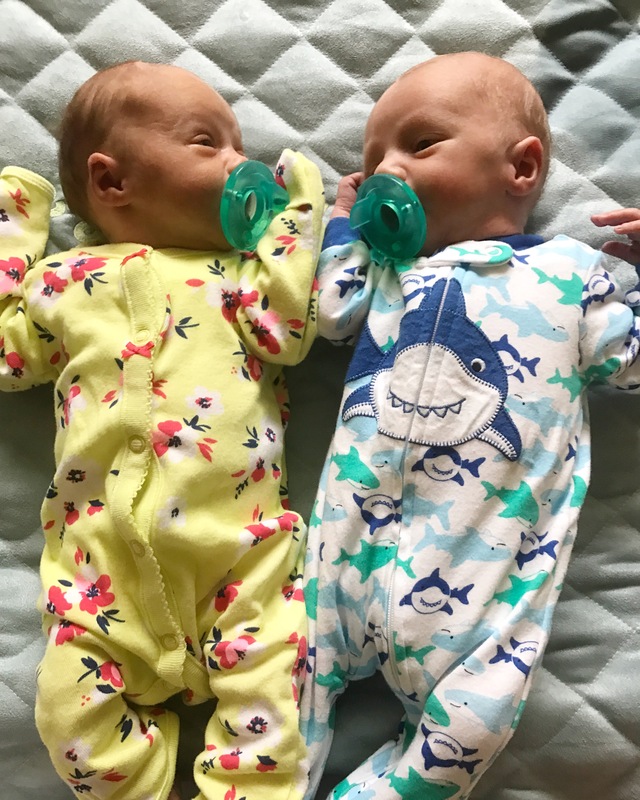 While they soon found both heartbeats, they couldn’t get them to stay in the monitors and it took over hour and half before they called in an advanced ultrasound tech to find where they were exactly. (Even the bedside ultrasound done by the nurses wasn’t able to help out.) Once the tech gave them specifics, we were able to get them on the monitors. We were relieved to know both heartbeats were strong and the babies were doing great. 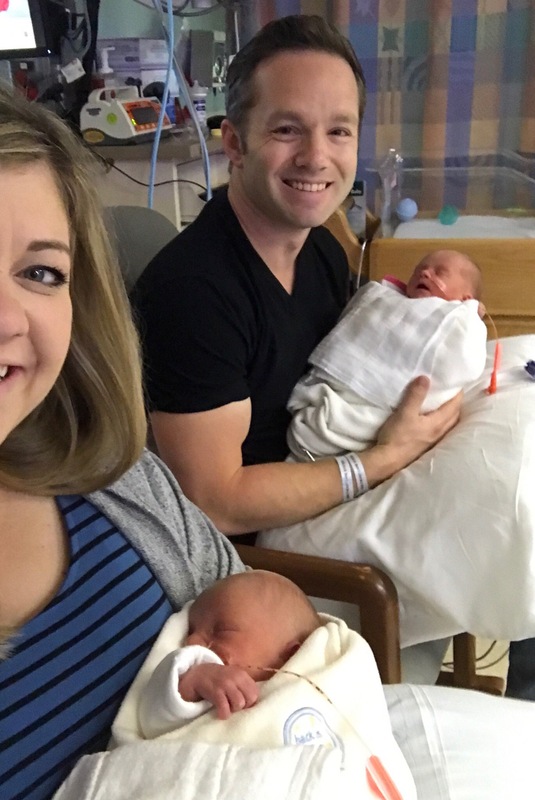 By the time all of the doctors, nurses, and techs started to slow down, it was after 8:00 pm and Josh reached out to finally give our families an update. It shouldn’t have been a surprise to us that both sets of grandparents were waiting in the waiting room for a call! 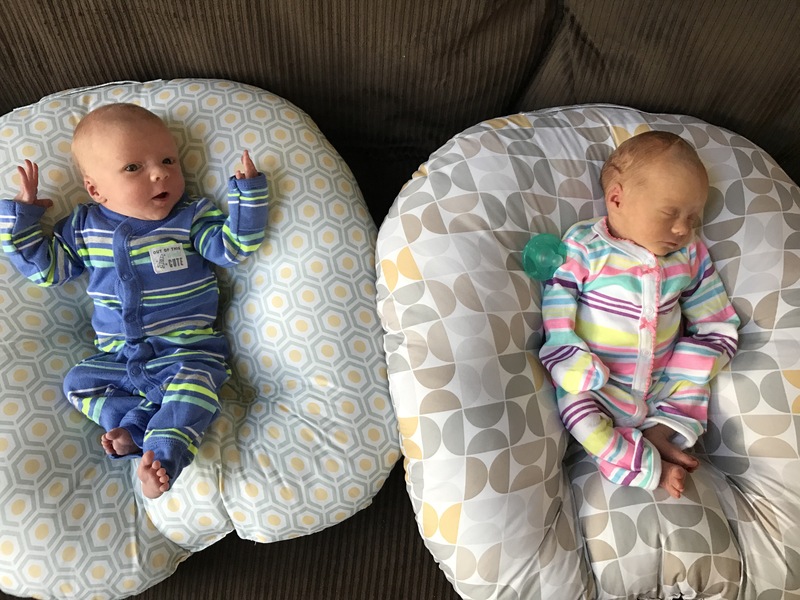 We had established with our doctor a plan to hold the babies in ideally till Wednesday so that we could do 2 rounds of steroids, 24 hours apart, for the babies lungs, and 48 hours of magnesium for handful of reasons. We then needed to give everything at least 24 hours of optimize full benefits, and so May 10th at 8:00 am became our goal date and time to make it to. Often times, once a woman’s water breaks, labor begins, so we truly were blessed and lucky that it never happened for me and that the medications didn’t cause any uncomfortable side effects, as magnesium is known to be particularly brutal. 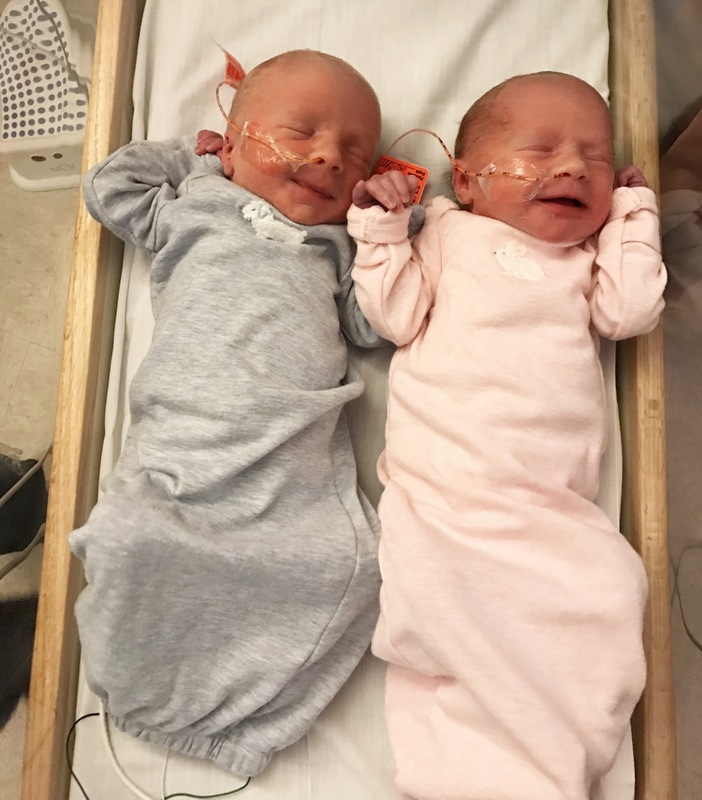 Over the few days, the babies were incredibly difficult to keep on the monitors and my need to get up regularly to go to the bathroom caused a lot of work for the nurses. I was assigned a 1:1 nurse to just sit and hold the monitors onto my stomach and it would often take over an hour just to relocate the hearts once I or they moved. I can’t thank my amazing treatment team enough for the incredible care they provided. We had the BEST nurses, truly. I had heard our hospital, St. John’s, had great nurses, but the care and love from their staff went above and beyond what we could have asked for. I managed to find a spot on my left side laying horizontal that seemed to give us the best chance of keeping them both on the monitors and so that became my new norm. It didn’t matter that it meant my back was to the tv, or it was on a painfully numb part of my hip due to damaged nerves from injections, or that I had to eat laying down — it was all worth it to keep these babies in as long as possible! Monday we had visitors. My friend Jana brought us lunch, my mom brought us items we had forgotten at home, my sister stopped by to visit, as did Josh’s parents and my sister in law and nieces. Our room was filled with snacks, flowers, and love. Tuesday was a quiet and surreal day and I am thankful for the space people gave us to be “just us” one last day. I was emotional at times as I processed was the next day would hold. 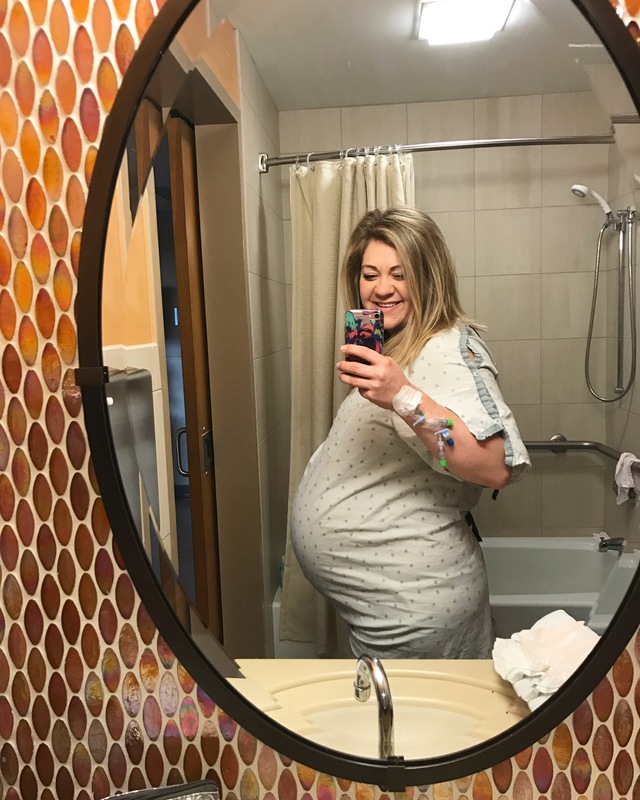 And in a small world moment, a follower of our story had a mom who worked on the labor and delivery unit and we soon became known as the couple with a blog and routinely were able to share our story with staff coming in and out asking questions. It seemed like God wanted to use even the last hours of this chapter to continue to share with others the glory He was owed. Wednesday morning our day started early. I had to take a shower using a special wash and then we met with numerous members of treatment team, our doctor, our nurse anesthetist, our anesthesiologist, the NICU doctors and nurses, etc. 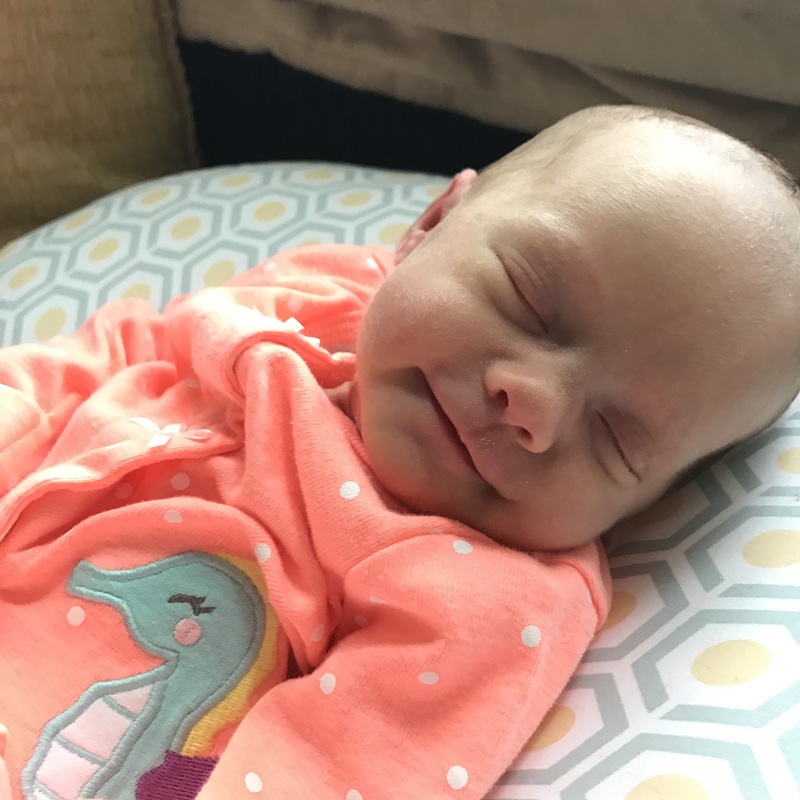 We had opted to have a c-section at this point to minimize the risk factors I was facing — having broken water with group b strep, gestational diabetes, factor v, and my anterior placenta for baby girl, being just some of them. We were so blessed that both sets of parents, as well as my sister and my sister in law, arrived before my surgery and gathered around my bedside and prayed with Josh and I. The tears and joy in the room was sacred. And then I walked myself into the OR. And within minutes I had my spinal block, was prepped and on the table and the team was ready. That’s when they brought Josh in and my emotions were calm yet high. I had a minor panic attack as I freaked out over the fact that I could feel my lower body but couldn’t move it. It was a sensation I would prefer never to have again. It was like being trapped in my body, unable to move yet having limbs. Yuck. Thankfully the AMAZING nurse anesthetist and anesthesiologist walked me into a conversation about my sisters wedding colors to distract me and it worked. An hour later, we brought in our families, 2 at a time, into the NICU, first Josh’s parents (as we thought we could bring in all 4 parents at the same time but my parents were sadly stopped at the door), then my parents, then the aunties, then the grandmas came back again and then my sister in law returned with Josh’s brother. Everyone was equally as tearful, proud, and overjoyed as we were. My nieces were at the hospital but unfortunately due to the NICU regulations, weren’t able to visit the babies. Thankfully the staff made an exception and allowed them to enter into the first set of doors to see them through a small door window. I was exhausted by this point and thankfully everyone excused themselves. We spent the evening with our babies and life as we know it would never be the same again. 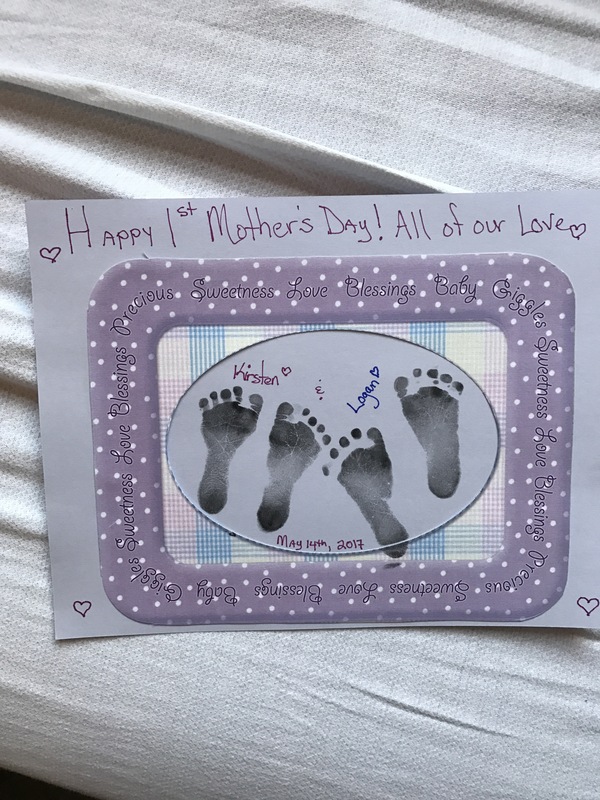 The next 12 days held a lot — but in short, on Mother’s Day upon my discharge, as we were saying goodbye to the kiddos to go home to sleep at night, Logan began having several back to back episodes in my arms, dealing with his heart and oxygen levels. Within seconds? minutes?, it became clear his body was likely trying to fight an infection of some kind and the NICU team sprang into action. I’ll tell you, going from kissing your sweet baby boy’s cheeks one minute to signing a consent for him to be whisked away for a spinal tap 3 minutes later, all while so many machines are beeping loudly, was one of the scariest moments of our lives. The next few days were stressful and we were thankful the hospital let us board in a room onsite to be close since I had already been discharged. We are thankful to share that everything is fine with our son and the infection his body was fighting was minor enough to never appear on cultures and was cleared up within days. A very special thank you to our NICU nurse Melissa for surprising me with this precious gift. Then, Monday night, as I was getting into bed, my incision burst open and I began to leak (gush) a watery bloody mixture. It lead to spending midnight – 4 am in the ER, followed by time with my doctor the next morning. My body was retaining so much fluid that it literally just was trying to force its way out of any possible spot, and my incision was one of them. Tuesday was really hard, my breakdown day from exhaustion, physical pain, worry for my son, and then learning I would need to be readmitted and require surgery under general anesthesia to reopen my, c-section incision, drain me, clean me out and sew me back up. This took place on Wednesday afternoon at 4:30 pm (a long day without food and water!) but I felt immensely better after I was drained. At this point my body was shutting down into total exhaustion, as I was/am pumping every 2 hours (especially crucial trying to get my milk supply in and up to the twins feeding needs), was constantly being monitored and poked and prodded, and then wanting to be in the NICU at their every feeding. My doctor, bless her heart, allowed me to be discharged Thursday night instead of Friday, so that I could go home and sleep in my bed. It was wonderful, as was seeing Cali again, although it was so hard being away from the babies. Here’s the thing, remember how today was our original c-section date? After living these last 3 weeks, both Josh and I have said a million times over, that we would have had their arrival no other way. God was two steps ahead of us the entire time and our time was so clearly orchestrated by Him. Had they been born today, they would have been housed in our hospital room, and we would have been sent home in 4 days. Perhaps I still would have needed a second surgery, which would have been brutal having to be away from home and only with Josh there to support them. Logan’s first bath…hated it. HA! 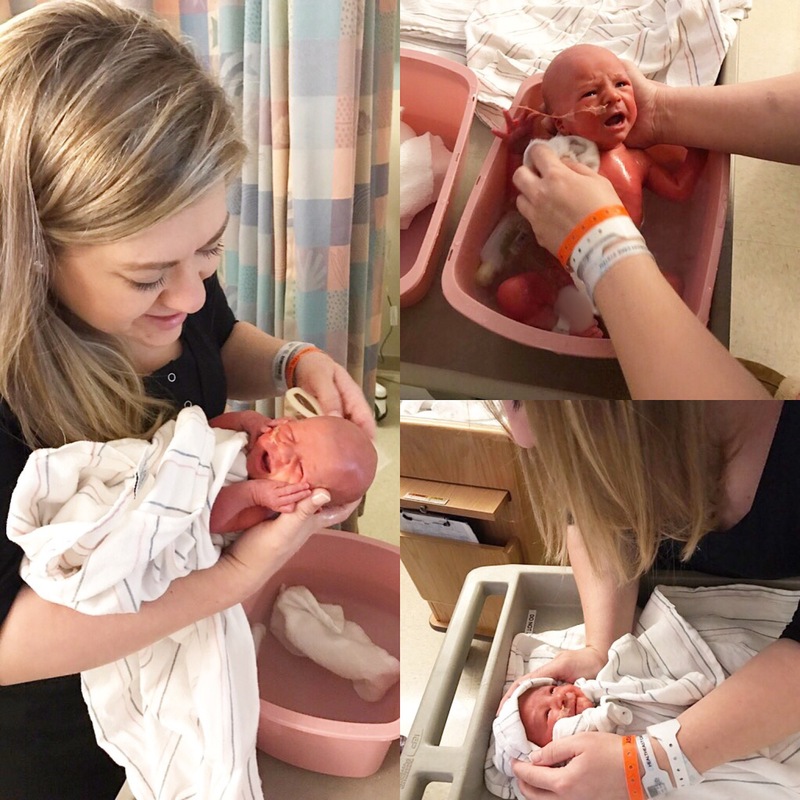 Kirsten’s first bath … she loved it! But because they were born on May 10, we were blessed to have them in the NICU and we could learn from the best team around. We learned different ways to feed them. We learned multiple ways to burp, dress, and change them. We learned how to spot diaper rash and what to do. 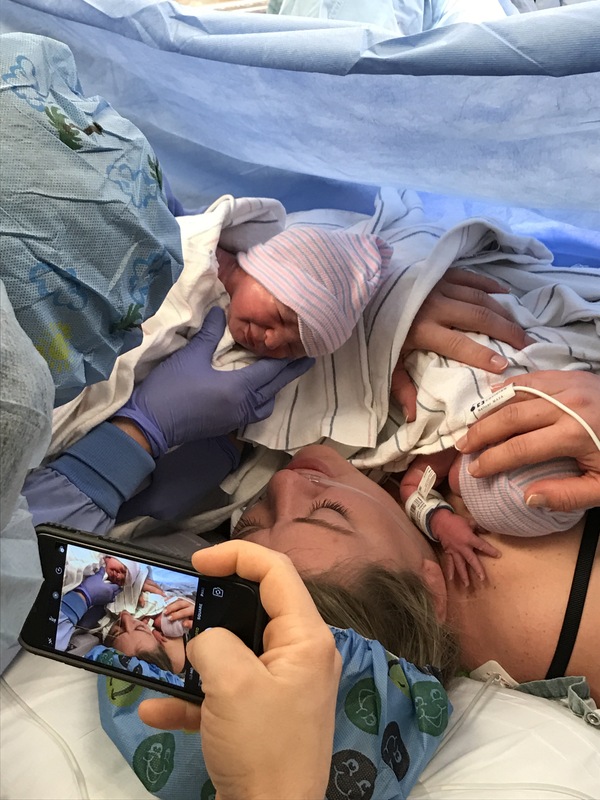 We had nurses by our side as we did our first baths with them and I had nurses helping them latch as they were fed by feeding tube, so that they could associate being full with breast feeding. 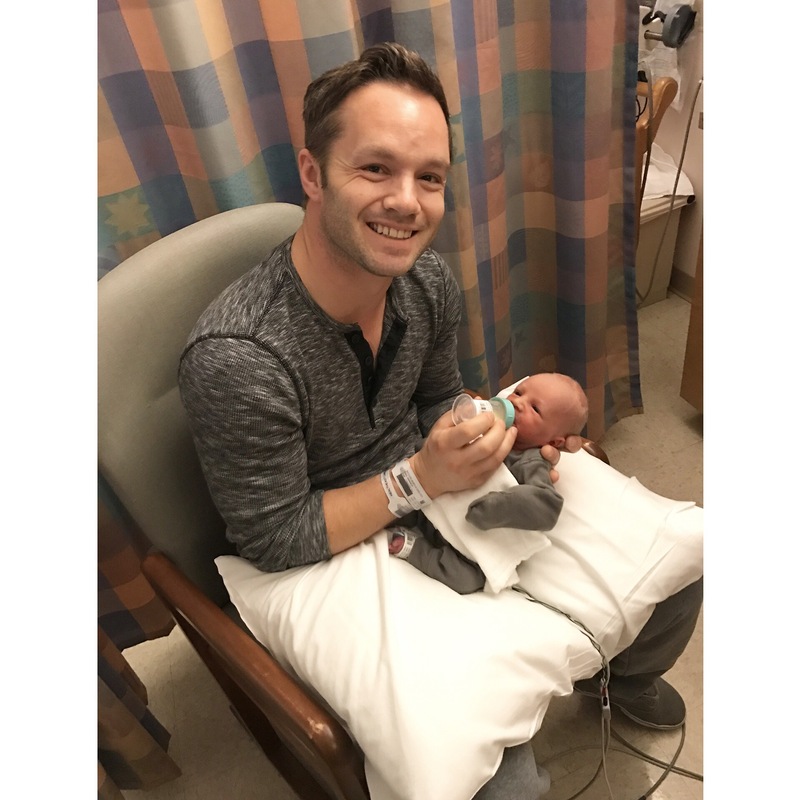 I had 12 days to work with the BEST lactation consultants, who helped me repeatedly learn to hand express and pump and how to determine what size shields to use and how to obtain and use my rented Medela Symphony. (AMAZING). On Tuesday, the day I was readmitted, all boarders were evicted from the hospital due to a high census but because I was readmitted, I got to stay and be close to the NICU. Not only that, but I then had access to meals, nurses who reminded me to take my meds and practice self care, and a great overnight CNA who would run my milk to the NICU so that I didn’t have to take the painful slow walk there every 2 hours. Once discharged, the census had gone down and they reallowed me to board in my same room until the babies discharged. All of this was so helpful since I wasn’t able to drive myself for 2 weeks. I had easy access to my doctor and the NICU doctor for any and all questions. 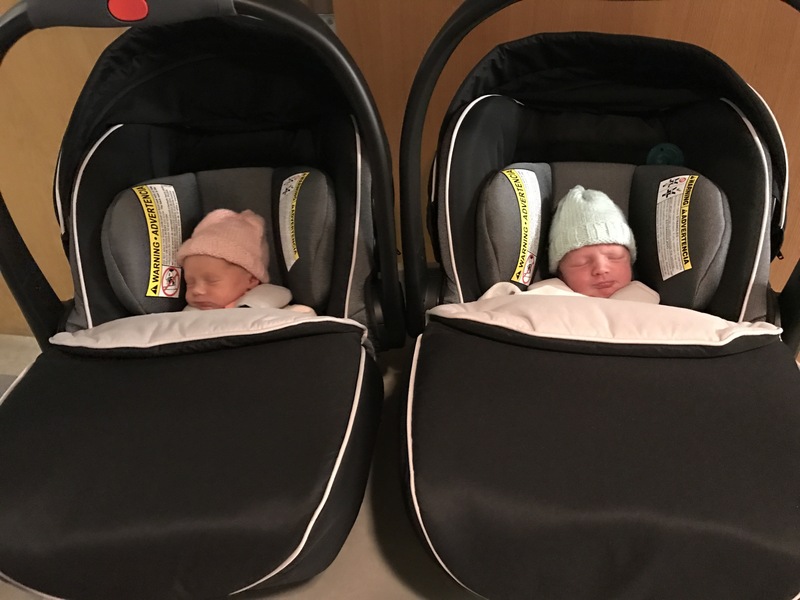 Because of Logan’s scare, the kiddos had some extra screening and tests done which provided us an immense amount of reassurance that these babies are a-okay. Guys, these 2 weeks and every complication, were some of the biggest blessings we never would have asked for. Yet GOD KNEW. 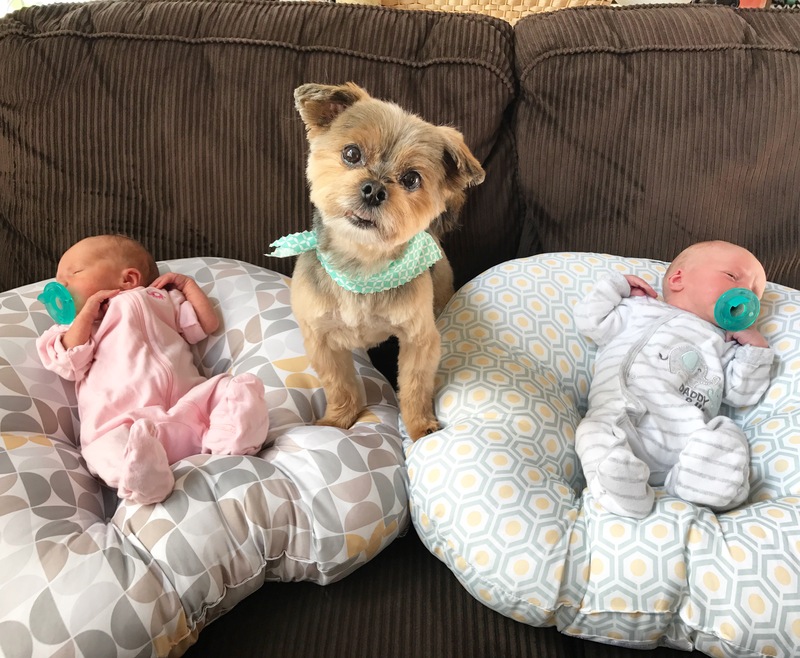 He knew that coming home with 5 day old twins would have been more overwhelming then it already was. 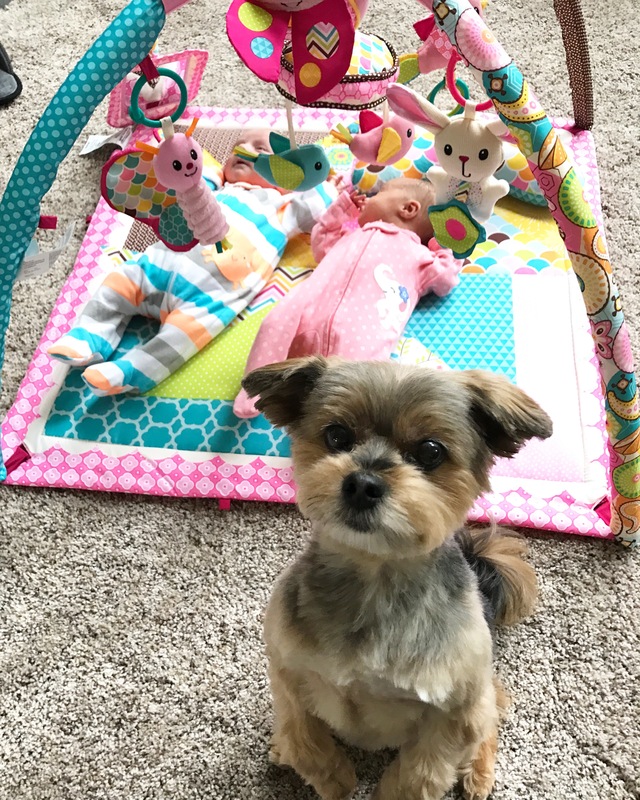 He knew that sending us home with babies on a regular schedule, who were eating great and used to constant noise, and had parents who were comfortable interacting with them, would be the best thing for our family’s big transition. He knew I would need that extra time to heal with the help and support of a great NICU staff. HE KNEW. Ahhh, He always knows. Daddy drove slowwwwwwly. Babies did great! I read a quote today that said: “Life can only be understood backwards but it must be lived forward.” and this month has been another example of how true that is. It’s hard to live in the forward, where we don’t always understand why things are happening. And yet, God knows the forward and backward and uses it for our benefit, or at least for His glory in the hard moments. I now have a unique understanding of what it’s like to be the mother of preemies and what it’s like to have children in the NICU. My story has been expanded and my empathy for others has grown. God is good friends. One chapter has closed and another has opened and it’s only a handful of days in. This new chapter is beautiful, joy-filled, exhausting, overwhelming, sacred, emotional, precious, messy, and filled with so many kinds of tears. I’m navigating these new waters with Him by my side as I transition into a Mom, and shift so much of my identity. I’m thankful for the good days and remind myself that the hard days with twin infants are the best kind of hard days to have. We are infinitely blessed. I have so much more to share with you guys, but today, on June 2, this day that was written differently than planned, had to share with you the fact that God’s planning is even better than ours. Thank you Lord for these precious miracles. You are so good! Friday, May 26, 2017 – Both babies made it through their first bath at home. Logan was very proud he survived the acid pouring. Thanks for the constant love and prayers. I am working to find our new normal and posts may be less frequent until I find my grove, but know I am thinking and praying for those still in the murky waters of infertility. The pain is still fresh and yet I can tell you it’s all worth it. So so so worth it. Ahhh Chelsea I am in tears over how beautiful and wonderful this story is and how good our God is. As i sat here an hour ago in tears of our uncertain future, thank you for the constant reminder that our God is so good and is in control! XOXO to you and those babies…and CAL too! I am crying happy tears for you both!! Thank you for sharing and congratulations! I look forward to meeting our little one in November after a long wait as well. I am so thankful for your encouraging story of how God knows all things and lovingly looks out for us by orchestrating things for our good when we trust Him. I will remember your experience through my future trials in life. Thank you. Praying for you momma! Fantastic ! I am so happy for you and your family if four! Wishing you sleep and lots of happy snuggles!! I’ve never met you, but I’m so thrilled to see these precious babies and how you prayed for them and supported God’s plan for you to have them! You are brave and loving parents. God Bless all of you! I read all of this with tears rolling down my face. God is so good. He was SO in the midst of all of this. And your babies!!! Gah! They are perfection. I can’t get over that photo of them laying nose to nose. So much joy! I am so happy that your babies made it here safe and sound. I love your love for God!! HOWEVER! You need to be real – you need to share about the struggles, anxiety, stress, etc. You post to much about how great life is and too little about what you are suffering through. Too much sugar coating going on! Be real, be honest and share the difficulties you go through!! She has a REALly strong ability to see all this joy in all her struggle. Don’t you think? Best post ever, perhaps? I love that you captured every little detail too, the details that you will hold on to forever. 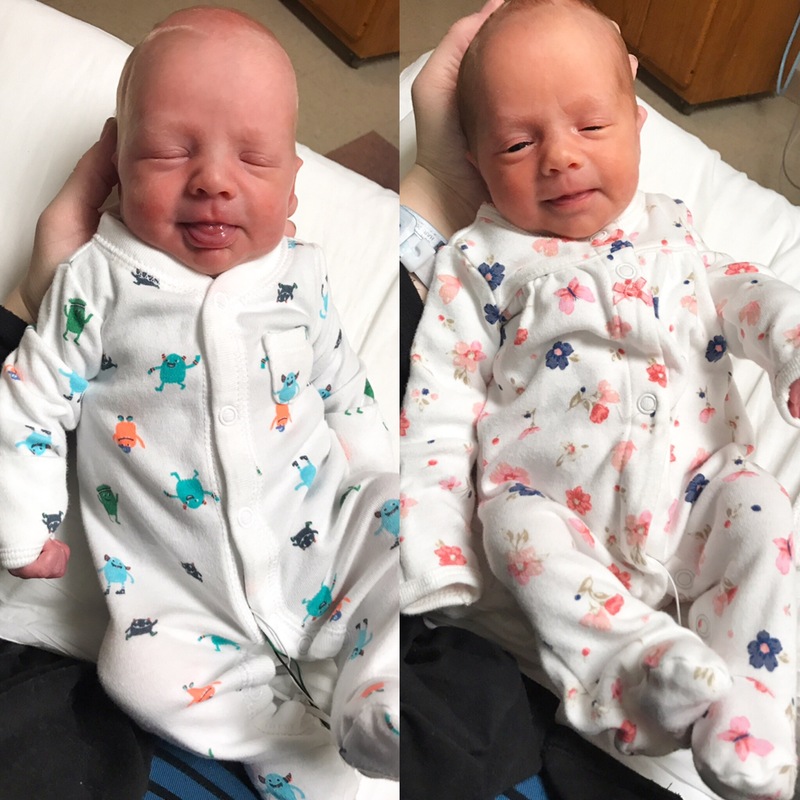 These pictures are just perfect and after some of those rough moments you had in the hospital, I am so glad you are at home with your two miracles! They are so completely and utterly perfect. I was welling up reading this just overwhelmed with joy for you both as well as hope for myself to one day have my own miracle. “So are my ways higher than your ways and my thoughts than your thoughts. This blog and article are so beautiful!! Really love this blog.